It seems as if my life has centered around porcelain, in its many beautiful forms. 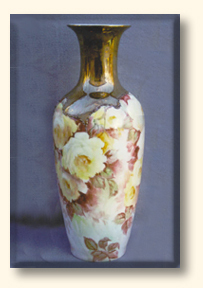 For the past 30 years, I have painted countless articles of porcelain, while studying under the best teachers I could find. In the endless variety of this medium, I continue to learn new and exciting techniques every day. The experience I have gained has been put to good use by teaching and leading others into the wonderful world of porcelain art. 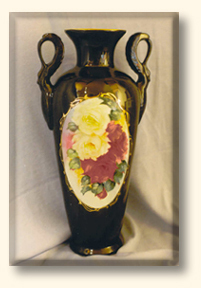 Porcelain painting is a true art form. The paint used is made from ground minerals mixed with flux, which will melt onto the glaze of the porcelain when it is heated in the kiln. Consecutive firings, which allow layers of color to be painted one upon another, create an incredible depth and visual interest that no other medium can claim. The true colors of a deep, dark red rose can be hypnotically stunning, as well as the rich tones of the greens. When these vivid hues are rendered and fused onto the porcelain, the effect can really be breathtakingly beautiful! Come browse through this photo gallery of fine porcelain. ENJOY!